The partners in the EU-funded HARFIR research project are pleased to announce that the 5th Japan-EU Open Workshop on Heusler Alloy Replacement for Iridium (‘HARFIR’) will take place on Monday, 30th May 2016 at the University of Konstanz in Konstanz, Germany. All interested parties are invited to attend. The goal of the HARFIR project is to develop rare metal-free antiferromagnetic Heusler alloy films to replace antiferromagnetic IrMn films which have been widely used in spintronic devices, including read heads in hard disk drives. The successful achievement of this goal demands a deep understanding of exchange bias effects and the magnetic properties of Heusler alloys. This open workshop aims to bring together scientists working in the above mentioned fields. From the project members, recent progress in the investigation of antiferromagnetic Heusler alloy films will be reported. In addition, experts from outside the project have been invited to present their latest research relating to either Heusler compounds or exchange bias. This workshop offers researchers the opportunity to discuss their results and exchange thoughts and ideas in a convivial atmosphere. The registration opens on Monday, 30th May 2016 at 9:30 am in room K07. The scientific program starts at 10am and ends at 5pm. There is no charge for attendance at the workshop, but participants must make their own travel and accommodation arrangements. Official registration will take place at the Workshop. 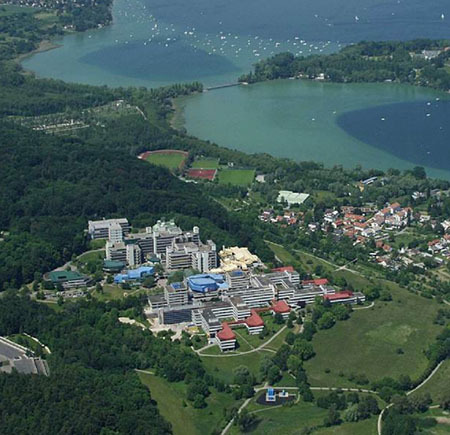 You can take a public bus to the University of Konstanz using lines 9A or 9B from the bus stop at the main train station or from the bus stop “Sternenplatz” (the closest bus stop to the Ibis hotel). It takes about 15 min. A pdf timetable of the bus service can be downloaded. The bus fare is €2.35 (single ticket) – you can pay it when you get into the bus. We plan to have a conference dinner on 30th May at “Brauhaus Joh. Albrecht“, a typical German restaurant. Enquiries about the Workshop should be addressed to Rocío Yanes-Díaz.